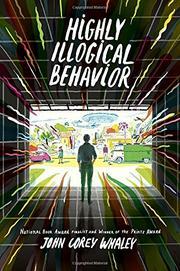 A teen with her sights set on a scholarship for a psychology undergraduate program befriends a boy with agoraphobia in order to write an essay about the experience in this novel from Printz Medal winner Whaley. Sixteen-year-old Solomon last left his house back in seventh grade, when, one day during a particularly horrible anxiety attack, he shed his clothing and climbed into a fountain at school. His former classmate Lisa, ambitious to a fault ("You're like Lady Macbeth without the murder" says her boyfriend, Clark), has long wondered what became of him and angles her way into his life. She begins to visit Solomon daily and is surprised at how funny and easygoing he is, eventually bringing into the fold a reluctant Clark, who quickly bonds with him. In part because Solomon has earlier come out as gay to her, this eventually piques Lisa's jealousy and sets the stage for a heartbreaking clash among the three. Chapters alternate between Sol’s and Lisa's third-person narrations and brim over with warm, witty, authentic dialogue. Solomon's descriptions of his anxiety are achingly real, and the adoration his family has for him, even as they fear he will never leave the house in their white, wealthy suburban neighborhood again, is poignant.